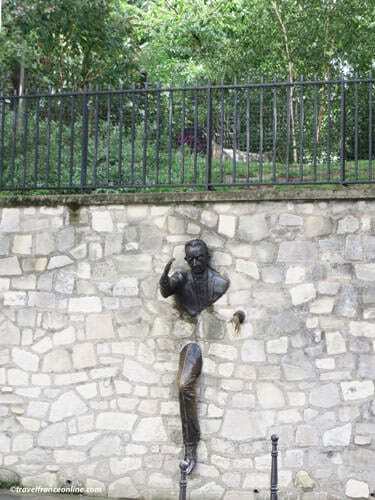 Le Passe-Muraille literally means 'the man who walks through walls'. It's the name of a larger than life bronze sculpture representing a man half-trapped in a stonewall. You'll find it in a private car park in rue Norvins in Montmartre. The French actor and sculptor Jean Marais created this unusual bronze patina sculpture in 1989. He indeed wanted to pay tribute to Marcel Aymé, a popular French novelist, screenwriter and playwright. Le Passe-Muraille, the hero of one of Marcel Aymé's novels, is Mr Dutilleul. Dutilleul is a modest clerk who works in an obscure ministerial department. However, one day he discovers that he has the gift of walking through solid walls! Dutilleul uses his newly discovered talent in order to avenge the humiliation that his colleagues and superiors subjected him to at work. He keeps using... and abusing his powers until the day they abandon him, just as he walks through a wall, leaving half of his body trapped in the stone. Marcel Aymé was not born in Paris. However, he spent most of his life in rue Norvins and used Montmartre as the setting for many of his novels. 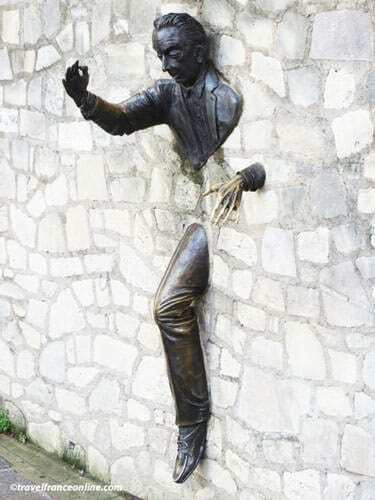 Le Passe-Muraille statue was placed in front of his house. Marcel Aymé is buried in the small St Vincent cemetery. Going to the discovery of Le Passe-Muraille will take out of the beaten track. You'll escape the crowded and noisy Place du Tertre; you'll also discover the lovely gardens, country houses and back streets of the village of Montmartre.